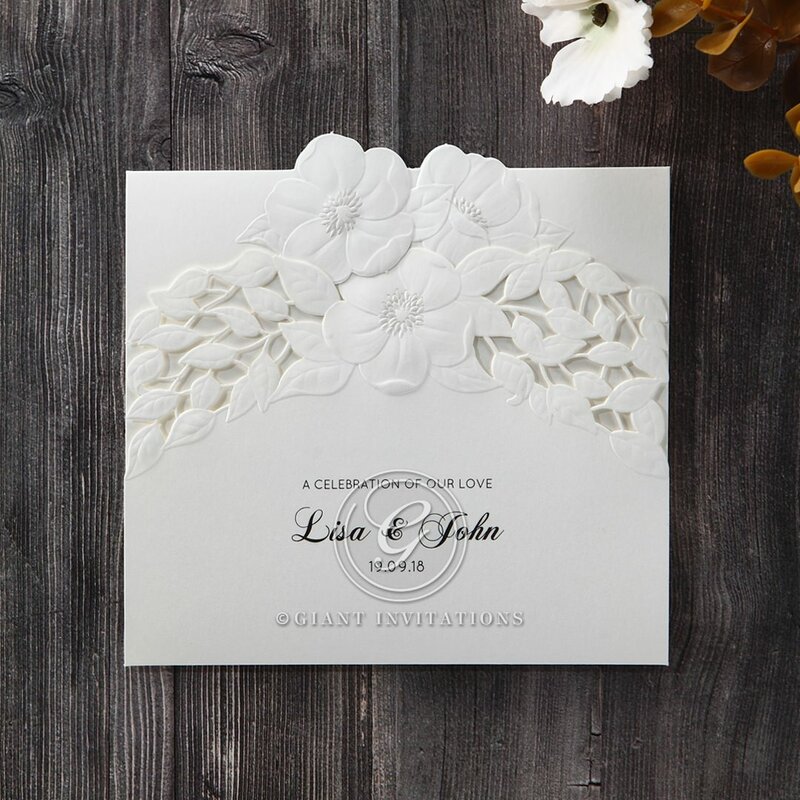 This delicately detailed bottom fold invitation features embossed blossoms at the peak of the fold, with delicate leaves and vines cascading down the sides. 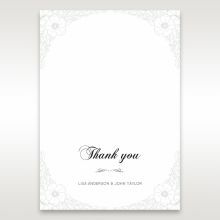 This is a sophisticated invitation that beautifully compliments your modern or vintage wedding theme. When opened, the top of the card features the same blossoms as those on the front. The wording, fonts, and layout are fully customisable. 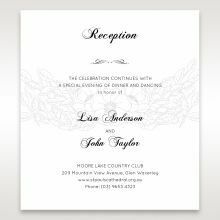 The invitation itself is matte white, and is printed in white ink. 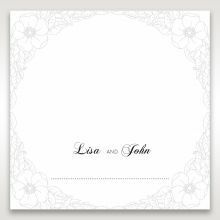 The Stationery Suite offers the same laser cut design in a watermark pattern. 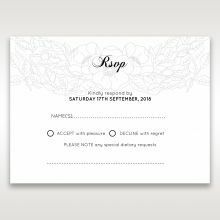 Order your RSVP cards, Wishing Well Cards, Place Cards, and more. I am very happy with the product as well as your fast service and very patient staff. Always response my queries on timely manner. The invitation card i received are exactly as I expected. I received my order within less two weeks which includes amending, digital proof and printing. I am definitely coming back for more gorgeous cards.I am recommending you to all my friends. May God bless you all. 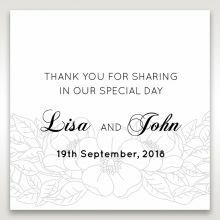 My order was exactly what I was expecting and I will definitely order my Invitations here as the service is quick and extremely easy to use. My samples looked exactly like the photos and the description was spot on. The packaging was neat and tidy and the samples were very well packaged as well as the free samples for a wishing well and thank you cards. The price was cheap and the staff were extremely helpful about any questions I had regarding my order. I highly recommend Giant Invitations if you want great service. Absolutely beautiful detail on these. The price is AMAZING and fits with my floral theme perfectly. 10/10. I’m going to purchase the matching save the date and wishing well cards too. 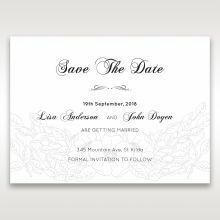 My fiancé and I have looked at many different places for our invitations and none come close to the quality and detail as these do I will be recommending to all the girls I know that need invites for their weddings too! Cascading flowers was one of four samples I ordered and this one was by far my favourite (and hands down my fiancé’s fav as well!). I loved the embossed details on the invite (so classic and elegant) and the amount of real estate available to position text was also handy. Once I had made the decision to go ahead with the design, the process of submitted, editing and changing text was so easy. And the online assistance which was immediately available just made my experience that much better! We’re now looking at ordering place cards and gift tags in the same style - so thank you Giant Invitations!! Before I began looking for my future wedding invitation I had a pretty good idea about what I envisioned my wedding invitation to look like. 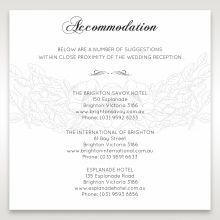 I chose a couple of different sample invitations from Giant Invitations that initially caught my eye but the 'Cascading Flowers' was definitely my favourite. The sample I received was so elegant and beautiful, just as it is pictured online. It will definitely be my perfect choice of invitation for my upcoming wedding next Spring! I received my cascading flowers sample invite in the mail and knew straight away it was the one for my wedding. It's elegant simplicity was just the look I was after. 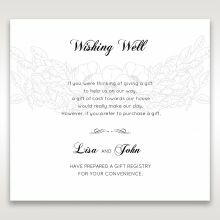 The invite matched the RSVP and wishing well cards perfectly and the quality of the card was great. I also loved how the text ink is raised, another special touch. Thanks giant invitations, you guys really know how to deliver memorable invitations. The five samples we received were of excellent quality and all them were beautifully designed. 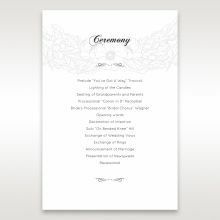 There is a wide selection of invitations to choose from, but in the end we decided to go with this cascading flowers design for our wedding invitations. The design is simple and elegant and for a great price. The samples were delivered very quickly and we will be placing our order for our wedding very soon. I am very happy with the samples I received! they came in a professional postage package and It was hard to choose just one invitation from the lot. After a bit of deliberation I have chosen this classic floral number. 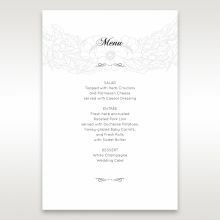 Great text style and format and the floral detail is elegant and dainty. I admit, the front is a little plain with the text so I will be adding a ribbon to make it a bit more special. But over all a great (and cheap) invitation! High quality samples and they send them out to you quickly. 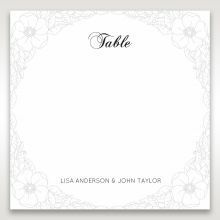 There's a great variety to choose from, with a wide range of colours and card stock to choose from. A number of friends have also used Giant invitations for their weddings. We will definitely be ordering our invitations, wishing well and RSVP cards from here. The three free edit runs before printing, is a fantastic idea. Can't wait to see what the final product looks like. Everything I was looking for. Simple, romantic and elegant. I especially love the way it unfolds open, gives the impression that it is telling a story.